Multiple system atrophy (MSA) is a rare atypical parkinsonian disorder characterized by a rapidly progressing clinical course and at present without any efficient therapy. 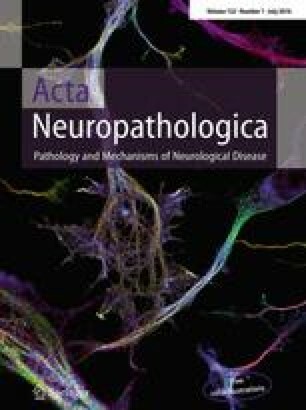 Neuropathologically, myelin loss and neurodegeneration are associated with α-synuclein accumulation in oligodendrocytes, but underlying pathomechanisms are poorly understood. Here, we analyzed the impact of oligodendrocytic α-synuclein on the formation of myelin sheaths to define a potential interventional target for MSA. Post-mortem analyses of MSA patients and controls were performed to quantify myelin and oligodendrocyte numbers. As pre-clinical models, we used transgenic MSA mice, a myelinating stem cell-derived oligodendrocyte-neuron co-culture, and primary oligodendrocytes to determine functional consequences of oligodendrocytic α-synuclein overexpression on myelination. We detected myelin loss accompanied by preserved or even increased numbers of oligodendrocytes in post-mortem MSA brains or transgenic mouse forebrains, respectively, indicating an oligodendrocytic dysfunction in myelin formation. Corroborating this observation, overexpression of α-synuclein in primary and stem cell-derived oligodendrocytes severely impaired myelin formation, defining a novel α-synuclein-linked pathomechanism in MSA. We used the pro-myelinating activity of the muscarinic acetylcholine receptor antagonist benztropine to analyze the reversibility of the myelination deficit. Transcriptome profiling of primary pre-myelinating oligodendrocytes demonstrated that benztropine readjusts myelination-related processes such as cholesterol and membrane biogenesis, being compromised by oligodendrocytic α-synuclein. Additionally, benztropine restored the α-synuclein-induced myelination deficit of stem cell-derived oligodendrocytes. Strikingly, benztropine also ameliorated the myelin deficit in transgenic MSA mice, resulting in a prevention of neuronal cell loss. In conclusion, this study defines the α-synuclein-induced myelination deficit as a novel and crucial pathomechanism in MSA. Importantly, the reversible nature of this oligodendrocytic dysfunction opens a novel avenue for an intervention in MSA. The online version of this article (doi: 10.1007/s00401-016-1572-y) contains supplementary material, which is available to authorized users. This work was supported by the Interdisciplinary Center for Clinical Research (IZKF Erlangen, TP E18), the Bavarian State Ministry of Education and Culture, Science and Arts in the framework of the Bavarian Research Network Induced Pluripotent Stem Cells (ForIPS), the Deutsche Forschungsgemeinschaft (DFG grant INST 410/45-1 FUGG), and the NIH (AG5131, AG18440, NS092803). The study was supported in part by the G. Harold and Leila Y. Mathers Charitable Foundation, the JPB Foundation, the Leona M. and Harry B. Helmsley Charitable Trust. BE is an IZKF PhD student and was supported by the IZKF Erlangen to conduct experiments involving stem cells in the Laboratory of Genetics at the Salk Institute for Biological Studies, La Jolla, CA, USA. JCMS is supported by a research grant of the Deutsche Forschungsgemeinschaft (DFG grant no. SCHL 21021-1). The authors greatly acknowledge the NBB for providing human post-mortem tissue. Excellent technical assistance was provided by Holger Meixner, Someya Salem, Arianna Mei, Jazmin Florio, Maria Hirblinger, Petra Rothe, Angelika Diem, and Heike Friebel-Stange. We thank Beate Winner and Chichung Lie for scientific discussion and comments on the manuscript. Mary Lynn Gage is greatly acknowledged for editorial comments. Human brain samples used in this study were obtained from the NBB and have been collected from donors for or from whom a written informed consent for a brain autopsy and the use of the material and clinical information for research purposes had been obtained by the NBB. All animal procedures were conducted with approval of the animal care and use committees of the University of California San Diego, the Friedrich-Alexander-Universität Erlangen-Nürnberg, and the state of Bavaria.